Clashes between rival militias continue, after fighting on Friday left more than 40 dead. 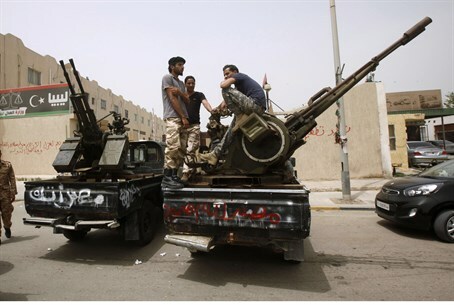 Fresh gunbattles have erupted between rival militias in the Libyan city of Tripoli Saturday, as local fighters seek to force out gunmen from a militia based in the city of Misrata. Saturday's fighting, in the suburb of Tajoura, come a day after bloody clashes between protesters and militiamen outside the Misrata militia's headquarters in Tripoli. Local authorities say at least 43 people were killed after gunmen inside the building fired on hundreds of demonstrators demanding they leave the city. More than 500 people were wounded. Libyan Prime Minister Ali Zeidan confirmed that fresh fighting was ongoing in Tajoura, and has called for calm amid fears that simmering tensions between rival militias could escalate into a renewed civil war. A local BBC correspondent reported that the latest violence was triggered when an armed convoy from Misrata attempted to make its way in to the center of the city, and was blocked by local forces. Zeidan urged all sides to "exercise maximum restraint", whilst demanding that "no forces from outside Tripoli should attempt to enter the city because the situation is very tense and could escalate further". The PM continued by declaring - somewhat ominously - that "The coming hours and days will be decisive for the history of Libya and the success of the revolution". Since the ouster of former Libyan dictator Muammar Qaddafi in 2011, many of the various militias who took part in the civil war have refused to disarm, posing a serious challenge to Libya's weak central government, which has repeatedly called on them to disband in favor of the country's fledgling army. Two years after the fall of Qaddafi, independent militias still control large part of the North African country and regularly fight each other. Just last week, anti-aircraft gunfire and grenade blasts erupted in several parts of Tripoli as rival militia groups were fighting. Recent reports indicated that Al-Qaeda terrorists in Libya are trying to get their hands on a massive weapons arsenal that was left behind by the Qaddafi regime. Qaddafi’s arsenal, which remains in an abandoned desert warehouse in southern Libya, reportedly includes 4,000 surface-to-air missiles, each capable of downing a passenger jet, and thousands of barrels of uranium yellowcake.